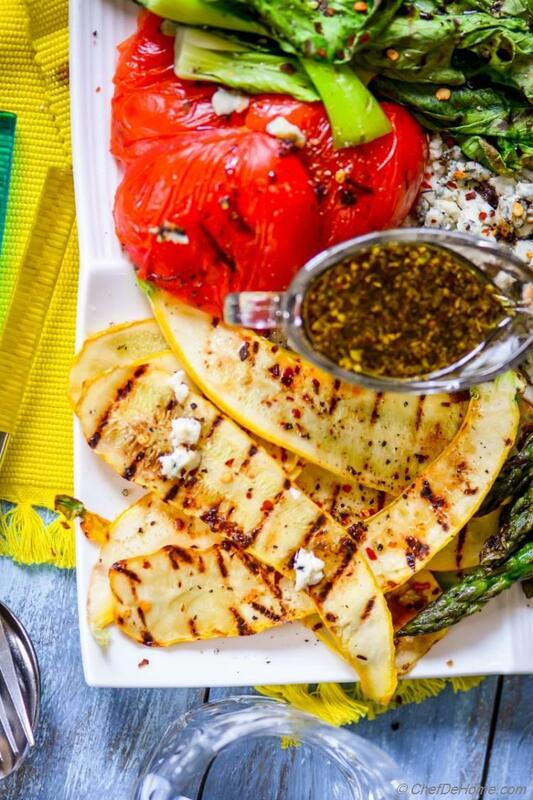 Sharing today, an array of colorful grilled summer vegetables with blue cheese and drizzle of sweet, spicy, and rich balsamic dressing!! 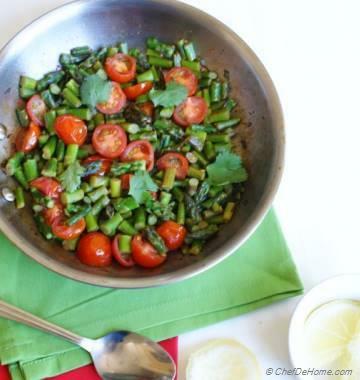 In my home, such simple salads are MUST for weekend grilling get-togethers! 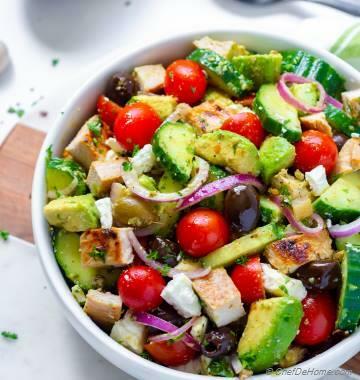 If you planning to fire-up the grill this weekend, then this healthy vegetarian salad can make to your menu in NO time!! All you need is: a few ingredients to make quick balsamic dressing and some blue cheese!! Rest, any fresh vegetable in your refrigerator is contender for this salad!! How easy does this sound? I love serving this salad for Summer Parties for two reasons. One, it fulfills the serving of vegetables and second, it is an interactive salad. 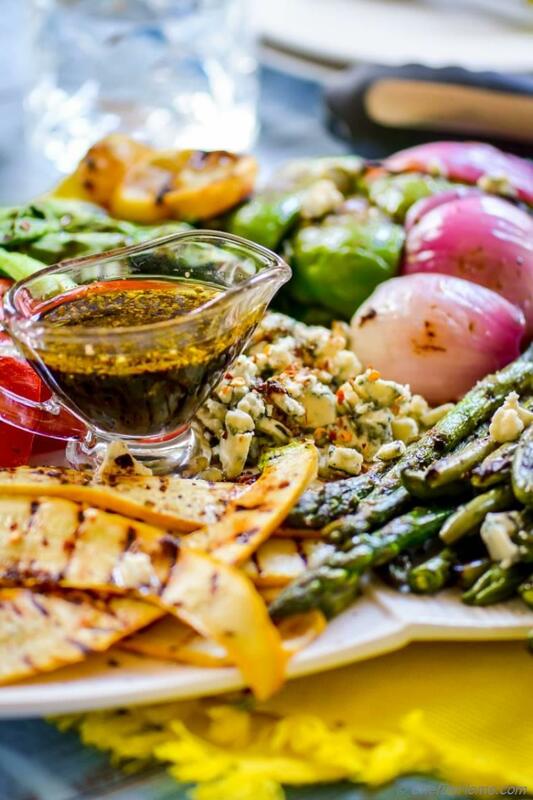 Grill vegetables of you choice and serve on a platter with heaping bowl of blue cheese and balsamic-ginger dressing on side. Everyone can build their own salad with any combination they like. You know the BEST part? If you have some vegan guests visiting, they can skip blue cheese and rest everything is VEGAN, even the Balsamic Dressing!! In my home, vegetables on grill keep changing, as per the availability of fresh produce. What never change is the dressing and blue cheese!! Balsamic Dressing can be prepared a day or even a week in advance and it is MUST for this salad! If you have never tried Blue Cheese with sweet Balsamic Dressing, then I'm telling you...... it is about time!!! I bet, you will love it!!! If you planning to fire-up grill this weekend, make sure to make a batch of balsamic dressing! 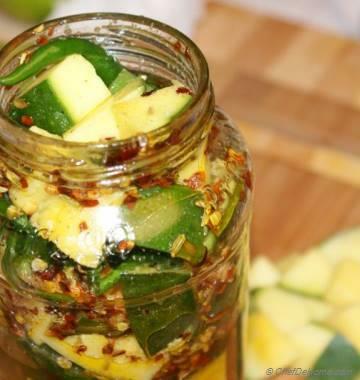 This dressing is so good, I even use it as marinade sometimes. So, my friends, fire-up grills, get outdoors, enjoy with friends and family!! 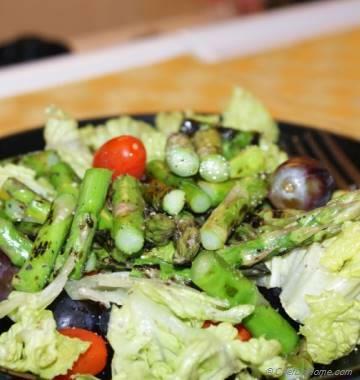 And don't forget to bring vegetables to the grill with drizzle of delicious balsamic dressing!!! Have a great weekend! - Savita. A few "grilled' main course to accompany this delicious salad! 1. To make dressing, in a small bowl, add grated ginger, balsamic, olive oil, oregano, and chili flakes. Whisk to blend oil with vinegar. Taste and adjust seasoning. Set aside. 2. To grill vegetables, heat a grilling pan. Slice all vegetables, then toss vegetables in 1 to 2 tablespoon of oil and sprinkle generous pinch or two of salt and black pepper. 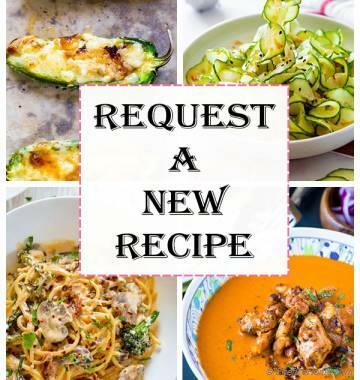 Grill vegetables with hard skin like zucchini, asparagus, bell pepper for little longer than leafy greens like bok choy. 3. To assemble salad, arrange grilled vegetables on a large salad platter and sprinkle with pepper flakes (optional). Serve dressing and blue cheese on the side. Or toss vegetables with half of dressing, serve rest on side. Crumble blue cheese over the top. Best when served at room temperature or warm. Grilled vegetable salad is perfect for a party! I love how yours is friendly to everyone and there are options for any combo here. It's so pretty and festive too! That looks delicious. I love grilling veggies and I often put a drizzle of balsamic on it, but I wouldn't have thought to add ginger as well. Yum! Thanks, Dannii! Ginger really pairs well with sweetness of balsamic. 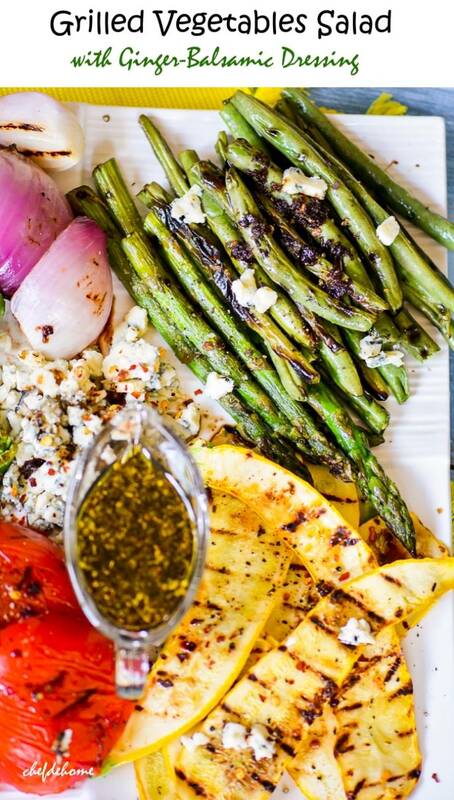 Love grilled vegetables! This salad looks awesome Savita! Mira, thank you so much, my friend! I don't think I've ever tried blue cheese with balsamic, but clearly I need to fix that problem soon! We love grilling veggies in the summer, so I suspect we'll have lots of opportunities to give this a shot. Thanks for the awesome idea! David, thanks for kind words! I hope you like it when you try. This looks like summer in a mouthful! Delicious! 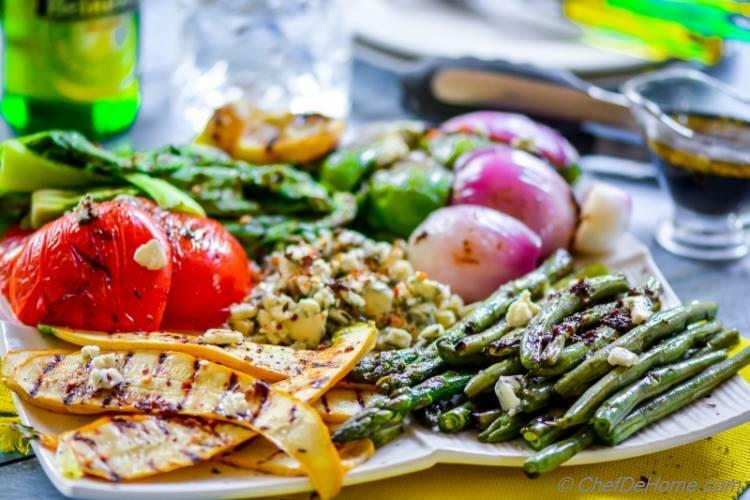 These grilled vegetables salad looks absolutely delicious.. love the dressing.. This is making my mouth water!!! 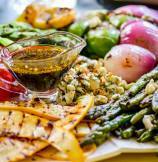 I love grilled vegetables - and balsamic dressing is one of my favorites. This is perfect!